Hello music video loving comrades! It’s Andy Gesner and the staff from HIP Video Promo, back with yet another vid that is certain to keep your eyes glued to the screen! With recent signings of acts like !! !, Grizzly Bear and Battles, Warp Records has made a home for ambitious and challenging rock bands – bands unafraid to experiment with sound and who aren’t tethered to formal recording or songwriting techniques. It surprised nobody who’s seen their mind-bending set that Battles, New York’s most challenging post-rockers, were snapped up by Warp and asked to record a full-length. Yet fans of Battles might be (pleasantly) surprised by what that full-length sounds like. 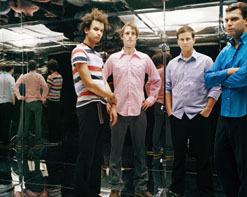 The band’s EPs were largely instrumental; the upcoming Mirrored, on the other hand, makes extensive use of vocalist Tyondai Braxton. The voice is an instrument, of course, and ultimately, that’s how it’s used on Mirrored – as a sonic component. It’s an element in a tapestry of sound, a carrier of strange melodies, a weird, haunting call in a forest of harmony and rhythm. NYC avant-garde aficionados will recognize Braxton’s bandmates: all three are veterans of the Downtown scene. Guitarist Ian Williams played in Don Caballero, Dave Konopka performed in the fierce Lynx, and John Stanier manned the drum-stool for the seminal and uncompromising Helmet. This is a quartet of sonic explorers, expert players, and musicians who’ve never produced a signal they didn’t want to process, pull, and stretch like Silly-Putty. It’s misleading to say that any member of Battles plays any particular instrument: rather, they each make sound, and they twist those sounds together into electro-rock sculptures. “Atlas”, the lead single from Mirrored, runs guitars, synths, vocals, and even drums through Moogerfoogers, ring-modulators, laptops, distortion and delay. Braxton splays his own singing voice with a foot-pedal; his words are near-unrecognizable, but his performance is nonetheless evocative. Best of all, the song rocks: for all its sonic trickery, the heart of “Atlas” is it’s relentless beat and drum-and-bass groove. The instruments, effects racks, gadgets, and quarter-inch cables are stars of the “Atlas” clip. The band is surrounded by gear: it frames their every movement. We watch hands on keyboards, feet on stomp-boxes, heads hunched down over pedal-boards, electric conduits connecting tone generator to amplifier to laptop computer. And if that isn’t sci-fi enough, the entire room is shown floating through outer space!, mirrored on all four sides, light streaming down from glowing panels in the ceiling. The walls reflect the wires and the players – at times, it seems like there are dozens of musicians, hundreds of instruments, and an infinite count of vintage foot-pedals and racks. Each member of Battles is stationed in his own corner of the cube, manning all controls at his disposal. The viewers are invited to watch through the glass as the spacecraft makes its way between the stars: a bubble of musical inventiveness, suspended in the blackness. Here at HIP, we’re thrilled to be working with Simon Halliday and all our friends at Warp Records to bring you a dazzling clip from their latest signing. We have plenty of copies of their latest CD Mirrored on hand for on-air giveaways, so don’t be shy! They will also be touring the East Coast throughout late March and into April, and we’d love to set you up with the band for video interviews. If you need more info, you can call Andy Gesner at 732-613-1779 or e-mail us at HIPVideo@aol.com. You can also visit www.bttls.com, or www.Warp.net to find out more about Battles.